2008 digitally remastered two-fer containing a pair of solo albums from the most popular member of the hugely talented Pop family, one of the truly astounding success stories of the '70s. a Portrait of and Too Young were both released in 1972. Featured are the singles 'Puppy Love', 'Too Young', 'Hey Girl' and 'Why'. 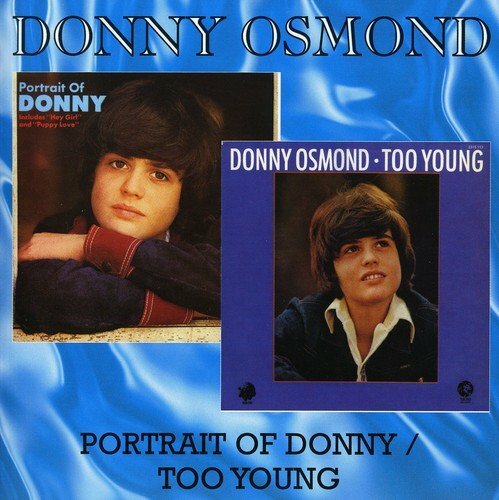 As with all of the 7T's Donny Osmond/The Osmonds re-issues this release features original LP artwork, liner notes by Phil Hendriks and picture of many rare picture sleeves of related singles. If you have any questions about this product by Osmond, Donny, contact us by completing and submitting the form below. If you are looking for a specif part number, please include it with your message.